I remember when I worked in an office and cake or cupcakes were brought in for a birthday… in the crowd there were always a few frosting people. Frosting people only go for the frosting, sometimes only eating the cake part that actually touches the frosting or no cake at all. In either case they’re easily identified by leaving a pile of untouched cake left on their plate. I’ve never understood these people and certainly have never been one. The frosting has almost always been my least favorite part of any cake.. homemade, store-bought, wherever. I’ve made buttercreams, whipped and meringue frostings myself, but none of them were really outstanding. Many times I make cake without frosting at all, just adding some powdered sugar or Cool Whip. Remember my Kitchen Tips post on Broken Buttercreams? Yeah.. I was no stranger to broken buttercreams either. Then a few weeks ago my Sur La Table The Art and Soul of Baking cookbook hit another home run (seriously, guys.. please buy this book?). The winner this week is White Chocolate-Cream Cheese Frosting. Yes. I first made it to go with Devil’s Food Cupcakes for a friends birthday. I found myself going for the bowl of leftover frosting in the fridge in the middle of the night (please tell me I’m not alone here?). For weeks after that I tried to find a cake to make that would really compliment the frosting (the Devil’s Food Cupcakes were a little too dense). 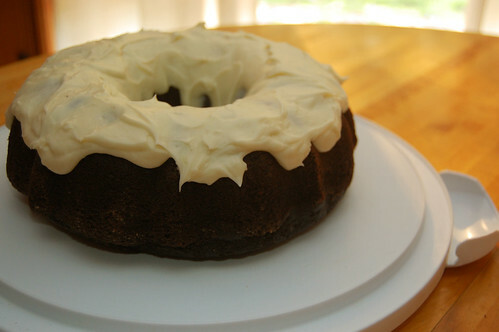 My plan was to make a Guinness Cake with White Chocolate-Cream Cheese Frosting mimicking the head on a Guinness beer. My cake failed. Last week though I paired it with Cookie Madness’ Really Good Chocolate Bundt Cake. Like the title says, the cake is really good! I’ve made it twice before and it’s always perfectly moist with a light crumb. I love adding coffee to chocolate cake because it really helps the cake actually taste like chocolate instead of flour (I’m not typically a big fan of chocolate cake.. they’re just not chocolatey!). This bundt and a drizzle of white chocolate frosting are a beautiful match. Please try it, and save some frosting for me. Consider rereading my Kitchen Tips post on Broken Buttercreams – using room temperature cream cheese and butter is pivotal to avoid broken frosting. Blend cream cheese, butter and lemon extract on medium/low speed in the bowl of a stand mixer (or use a hand mixer, but increase the blend time a little) for 1 minute. Scrape down the bowl and beat again for a few seconds. Sift in confectioners’ sugar and blend on low for a few seconds. Scrape down the bowl again and add vanilla. Beat on medium speed for 1 minute. Melt white chocolate (see our tips for melting chocolate), and cool for a few minutes. Stir white chocolate then add to the cream cheese mixture. Beat thoroughly. 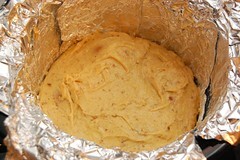 Use immediately, or, frosting can be made up to 3 days in advance if kept refrigerated in an airtight container. To soften, allow it to sit out to room temperature for 30 minutes. We had a reader request not too long ago for some guidance on how to make the Turkish dessert Baklava. The complexity lies in the use of phyllo dough, paper thin sheets of flour that are stacked atop each other to form the bulk this dish’s culinary mass. Countless adventurous bakers have undertaken the task of making Baklava, only to be met with frustration as sheet after sheet of phyllo dough tears and falls apart. The problem with phyllo dough is that it dries very, very quickly. Fresh out of its package phyllo dough is delicate, but certainly not fragile. The trick, then, is to take that window of not-dry opportunity and stretch it as far as possible (and working effectively in that window of course). The first thing you want to do is prepare a large clean area to work with. You want a spot for your phyllo dough, your baking pan, two bowls of filling and a bowl of melted butter with brush. Give yourself a little breathing room so you’re not bumping one thing into another, especially around the phyllo sheets. Feel free to move the fillings aside, as they will be used the least often. Preheat your oven to 325° and grease a 9 inch baking pan. 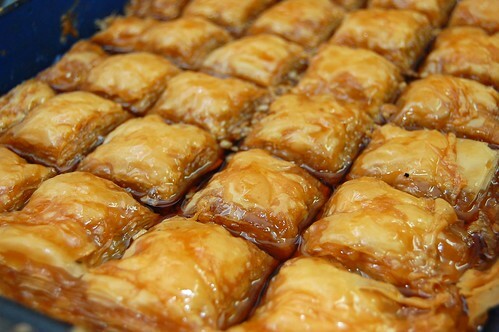 Be sure to grease it well, as baklava will tear or separate easily. Divy your phyllo dough into two stacks/portions and put one stack in the fridge, sealed. Place a sheet of plastic wrap on your work space and place the non-refrigerated sheets on top. Place another sheet of plastic wrap on top followed by a damp towel. 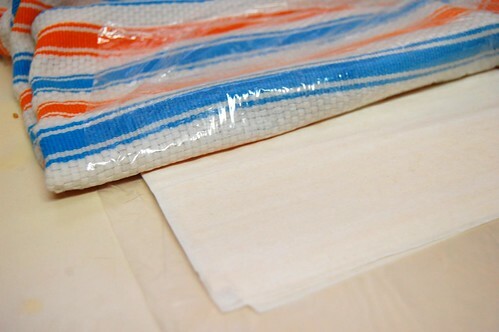 As you are working you will fold back the towel and top layer of plastic, remove the sheets you need, re-cover with the towel and plastic, repeat. This will slow the drying process. Work smoothly, efficiently, but calmly. If you’re feeling rushed you’re either working too fast or you need a Zanax. : – P If you get a little tearing here and there, don’t fret. When you’ve used all the dough from one stack, move on to the other. 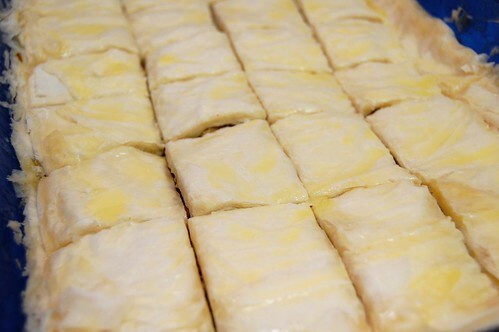 Place two sheets of phyllo dough into your pan and lightly brush butter on top. Place another two on top of these two and butter again. Repeat until you have a total of eight sheets in your pan. Sprinkle half of each of your fillings atop, distributing evenly as possible. Begin placing more phyllo sheets, just as before until you have another eight sheets added. 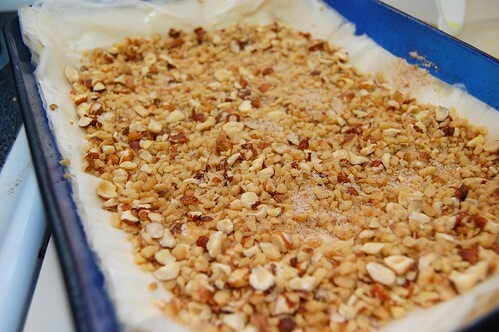 Sprinkle the rest of your remaining filling and continue placing the remaining phyllo sheets as before. 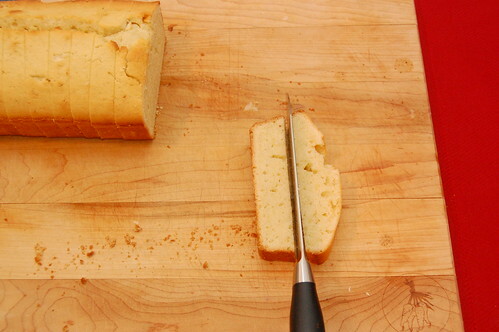 Take a sharp serrated knife (so it doesn’t crush or pull on the sheets) and cut into small 1-2 inch squares, but don’t cut quite all the way through (just eyeball it). My sister claims this helps your syrup absorb better. Bake for 35 minutes, reduce to 300° and bake for another 45-60 minutes, until golden brown. While baking, throw all your syrup ingredients into a saucepan, bring to a soft boil, then simmer for 15 minutes. Set aside. 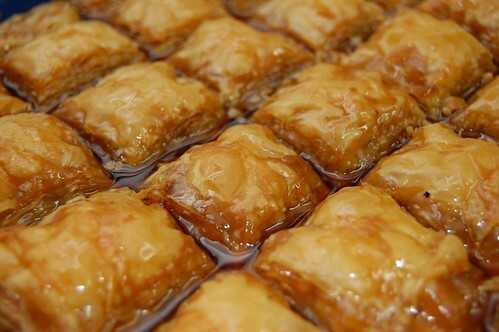 When baklava is ready, remove from oven and immediately pour your syrup evenly over the baklava. Let cool completely (this will take several hours. torture). Complete the square cuts and serve cold or rewarmed. Enjoy. Last year for my mom’s birthday I made a cranberry-lemon pound cake with lemon curd filling and Italian meringue lemon buttercream frosting. I wanted to do something lighter and fruitier this year.. something that wouldn’t make us feel like 500 lbs. after we finished eating it. Edwin tells me that I talk about Sur La Table’s Art and Soul of Baking book entirely too much. I tell him that because he doesn’t own it, he just can’t even begin to understand how it would blow his mind. We’re at a stalemate… too bad his birthday isn’t until late summer. But you guessed it, this recipe is from The Art and Soul of Baking, and it was everything I ever wanted. As I was making it there were actually a lot of firsts for me – I’d never worked with kumquat before (I actually wasn’t even entirely sure of what they were before setting foot in the grocery store), I’d never cut up a whole pineapple before (I’m not sure how I’d escaped this for so long… luckily this youtube video guided me through the process, which was much easier than I feared it would be), and I’d never worked with candied ginger (usually I leave it out of recipes because I’m not a big ginger fan, but it was wonderful and essential here. You can find it in the spice aisle in one of those tiny spice bottles). 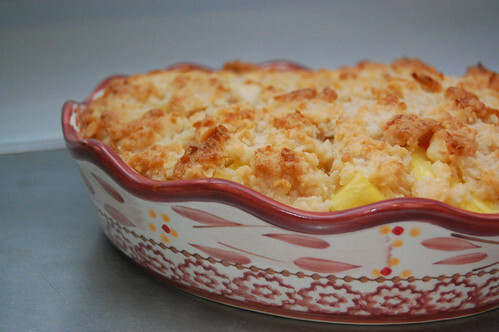 A few notes from the recipe – I baked this is a cute pie dish instead of a casserole dish and it worked out great. Also, I combined the topping ingredients in a stand mixer on low for a few seconds, but the pieces never got pea-sized… and I’m not sure they ever would have. It really formed the consistency of pie dough. So instead of sprinkling it over the fruit mixture, I really sort of laid it evenly on top (again, almost like a pie dough top). It turned out extremely well, so I don’t see it as a problem – just something to be aware of! If you don’t have the book yet (why.. WHY), you can find the recipe over at Steamy Kitchen. Did you know this past Sunday was Pi(e) day? Did you know there’s a peanut butter pie? A pie, of peanut butter?!?!?! Madness, you say? Poppycock? You are not alone, friend, for I can assure you that was my initial reaction when a particular young lady informed me of its existence. But low and behold, peanut butter pies do exist and are not some rarity invented by a small tribe living in some far corner of the world; possibly in some near-unapproachable mountains. With peanut butter trees. 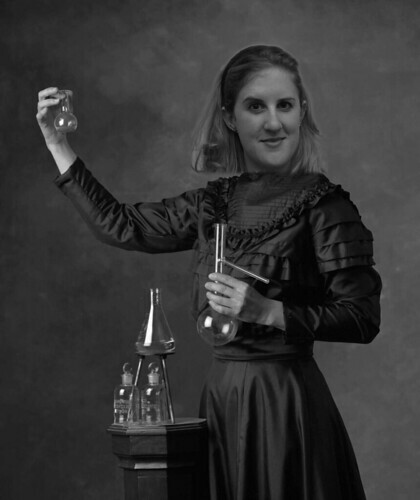 I wasn’t able to find the person credited with the first peanut butter pie but my first mental image, after the Pinatu Mountain Tribe was a 19th century Heather, dressed like Madam Curie with a high necked dress, analyzing peanut butter in test tubes. Best. Job. EVER. Whoever is responsible for its inception, I take my hat off to thee. Recognizing the awesomeness of peanut butter and pie, this was something I had to do and I did so immediately. I decided to go with an oatmeal crust which worked out well, but turned out a bit harder than I would have liked. Be sure not to over bake your crust when you try this! I wish I had more photos, but I took this to work and it did not last long. Be sure to have a glass of milk handy. Preheat your oven to 375° and grease a 9 inch pie pan. 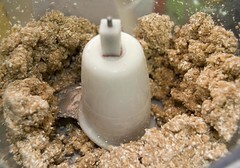 Run the oats in a food processor for about 30 seconds, then add your remaining ingredients and pulse until well combined. Evenly distribute your crust into the pie pan and up the sides and bake for 15-20; just until the crust begins to turn golden at the edge. Don’t over bake or you will have a harder, but still delicious, crust. Let cool completely. Mix together all your ingredients and pour/spoon into your pie pan. Bake for an additional 10 minutes. Melt your chocolate and butter via the double boiler method. Once fully melted, remove from heat, add the cream and stir until well combined. Let sit in the fridge for a few minutes to thicken and cool. Pour over your pie and place in the back in the fridge until glaze hardens. Serve and enjoy. 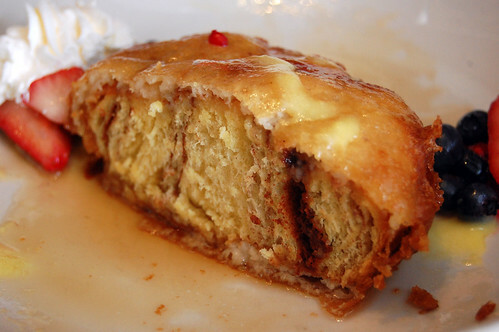 Food Photography – Fried Cinnamon Buns! I don’t usually eat that much fried food, I swear. But with Florida, all bets were off. 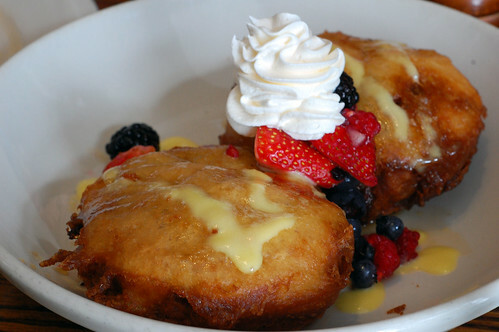 As if a deep-fried Oreo sundae wasn’t enough, the following day we reached new heights of culinary delight with deep-fried cinnamon rolls! Words fail to describe this the the full extent. This is something that must be experienced. Another delight from HUE. While you’re reading this I’ll be in Florida! A friend of mine is getting married and she and her husband have decided to do a destination wedding at Disney World. Three of us, motivated by either love of the open road or thrift, have decided to drive all the way down to Orlando, starting early (early) Friday morning. It should be quite the journey and we already have plans to check out Paula Deen’s restaurant in Savannah. Everything else is up in the air. Mmmm, apples. So delicious. I couldn’t resist conjuring up something in the ol’ crock pot with apples; and the sweeter the better! 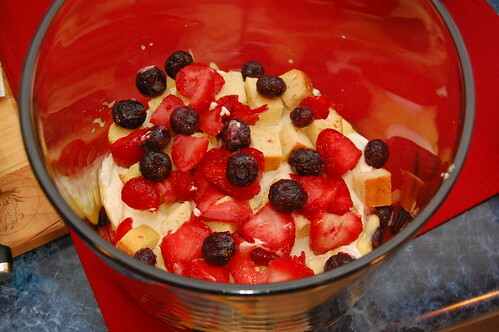 Crisps are delicious baked fruit dessert with many excellent candidates to take on the starring role, but there is a cool twist you can take with apples, using the fruit itself as the dish. This is a twist off an excellent Alton Brown recipe, who I must credit for this idea. Very delicious. 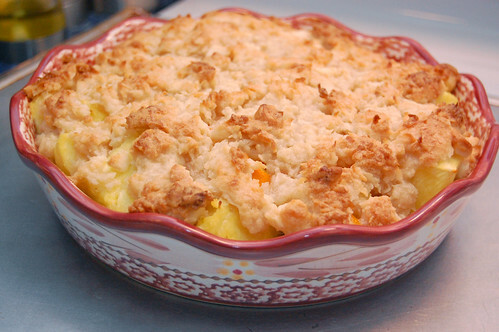 This recipe makes plenty of filling for 6 apples. You can scale it back if you’d like or just sprinkle over. Cut a thin layer off the bottom of the apples so they sit flat. Do the same with the top and peel a third of the way down. Rub the exposed parts with lemon juice so it doesn’t brown. 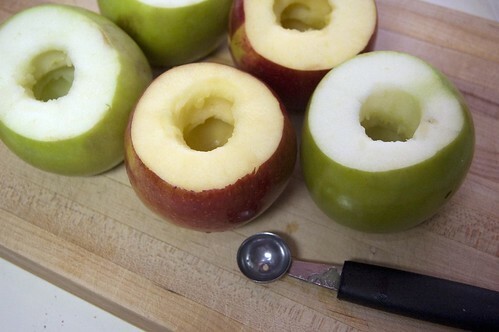 Core the apples without going all the way through (don’t lose any sleep if you do). Hollow it out a bit for the stuffing. Combine the remaining ingredients except the apple juice and work in your hands until everything is combined and the butter is in loose clumps in a sandy mixture. Stuff the apples with your filling until overflowing and place in your slow cooker. 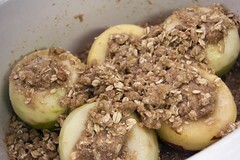 Sprinkle your remaining filling over the apples, followed by the apple juice. Cook covered on low for 4-6 hours, until the apples are tender. Serve hot, chilled or at room temperature. Enjoy. I was not raised with a need for fancy desserts – Pillsbury funfetti cake, ice cream cakes for birthdays and Eggo waffles layered with Neapolitan ice cream at my grandmother’s house were among my favorites. So the idea of making a cake in a slower cooker sounds just fine to me! However a quick search of slow cooker or Crock pot cake yields results called something like “dump cake” or “chocolate mess cake.” Though I imagine these cakes to be much like my idea of heaven – a pot full of warm, gooey, fudge-like cake to completely make a mess of myself with – that’s probably not what you guys come here for. 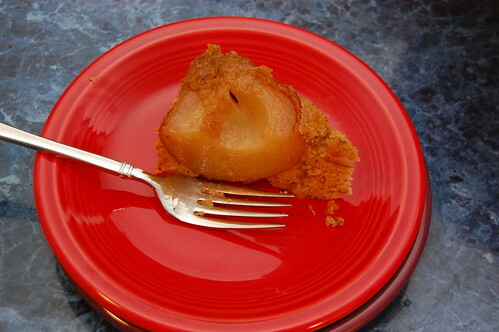 A pulled a recipe out of my November Food Network Magazine for Pear-Pecan Upside-Down Cake. I had my reservations about it, but it mostly turned out well! 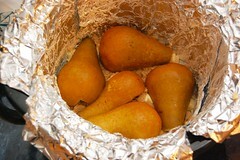 I couldn’t fit the 3 Bosc pears it calls for in the bottom, I could only fit 2 and a sliver. I thought I had a 5 quart slow cooker, so maybe the pears used in this recipe were abnormally small? One of the sides got a little darker than the other. I wonder if this might have anything to do with me opening the lid a crack to peek in and somehow throwing off the cook temperature. It’s possible! So do not peek! Ever! You’ve got to like pears. 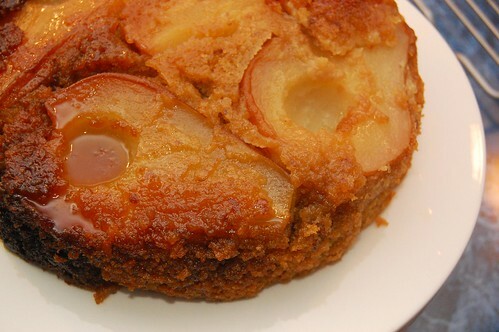 This cake is like sweetened pears with a side of cake. 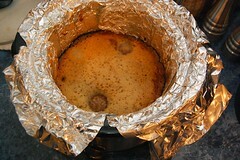 Make sure you cool the cake for an extra 10 minutes after removing it from the slower cooker, before turning it on to a platter. I did not make many changes to the original recipe. I didn’t use whole milk at room temperature, I used skim milk that was still cold. 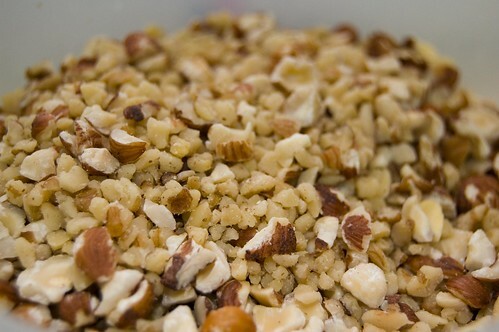 I didn’t toast the pecans first, and I combined pecans with some cashews. 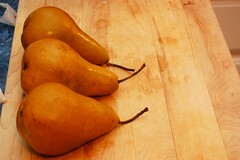 When picking out your Bosc pears, try to get pears on the small side; large pears tend to take over the cake. Again, though it’s not the most aesthetically pleasing cake ever created, it’s really a very tasty and light breakfast cake. 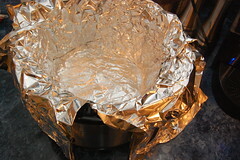 Butter the inside of a 5-quart round slow cooker and line it completely with a large sheet of foil, butter the foil as well. 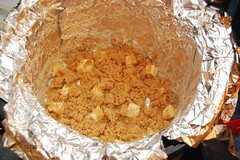 Turn the cooker on low and sprinkle the cut-up butter and the brown sugar over the foil. 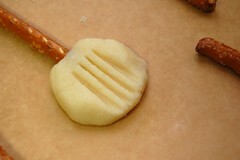 Add pears, arranging them in a circle, cut-side down. Mix flour, nuts, cornmeal, baking powder, cinnamon, nutmeg and salt in a large bowl. 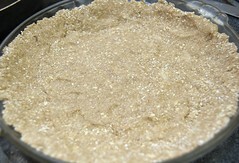 In the large bowl of a mixer, beat the softened butter and granulated sugar on low until just blended. 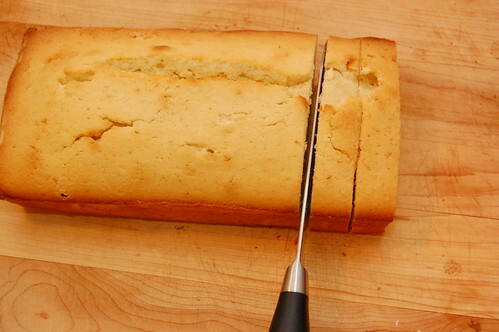 Increase the speed to high and beat until light and fluffy, scraping the sides as needed (3-5 minutes). Beat in the eggs, one at a time. 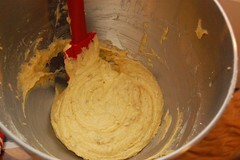 With the mixer on low, alternate beating the dry ingredients and milk into the butter mixture in two batches, beginning and ending with the dry ingredients. Mix on medium just until smooth. Spread over pears. 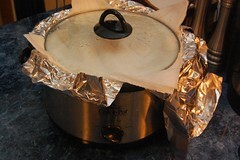 Drape paper towels over the top of the slow cooker (just under the lid, not touching the cake) to prevent condensation from dripping onto it (do NOT peek once cooking starts!). Cover and cook on low about 3 hours, when cake sets and the sides brown. Turn off the cooker and let the cake rest about 20 minutes. 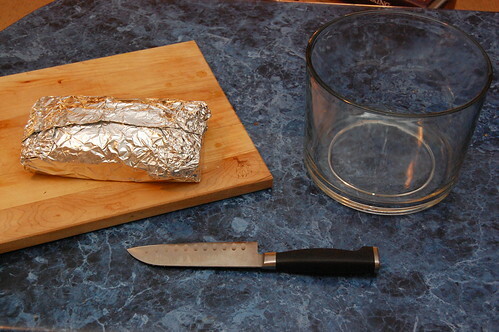 Lift the cake by the foil and place on a rack to cool for about 10 minutes. Carefully invert onto a platter and peel off the foil. My eyes aren’t fully undilated, so please forgive any typos or bizarre things contained within this post. I feel fairly cross-eyed! So the other day I was thinking about things I could make for dessert that aren’t so heavy. 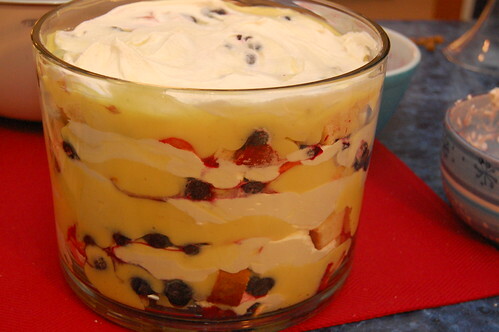 I came back to my old favorite, the red, white and blueberry trifle. However I realized after looking through this post that I was rather vague with the assembly. So why don’t we walk through that a little better? 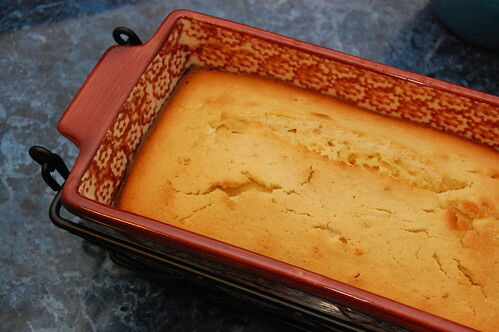 First bake and cool a delicious vanilla pound cake. 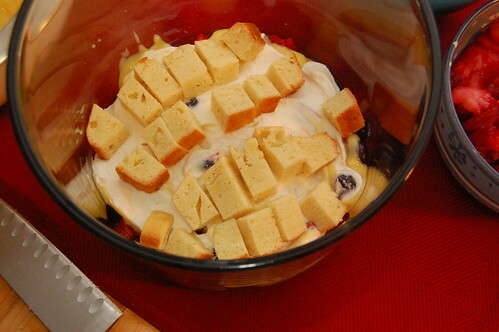 My favorite for trifles remains the Double Vanilla Pound Cake from The Art & Soul of Baking. I let my pound cake cool, wrapped it in foil and let it sit overnight so that it wouldn’t crumble when putting together the trifle. Next, gently trim away any crusty edges. 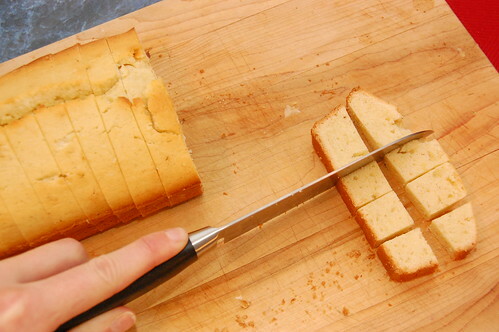 Cut the pound cake to one inch slices. 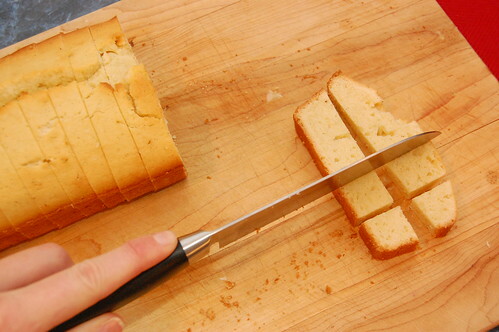 Cut each slice in half long ways. We’re going for 1/2 inch to 1 inch cubes. 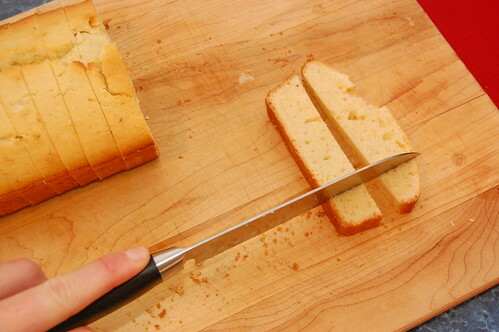 You could also cut two slices at once to save time if you wanted. 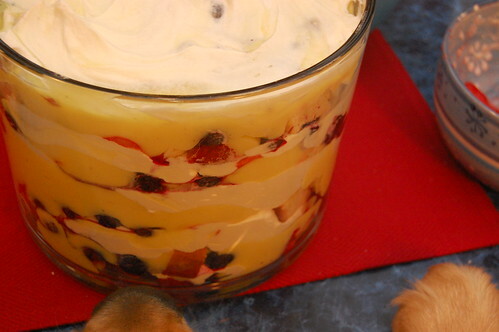 Arrange your first layer at the bottom of the trifle bowl. 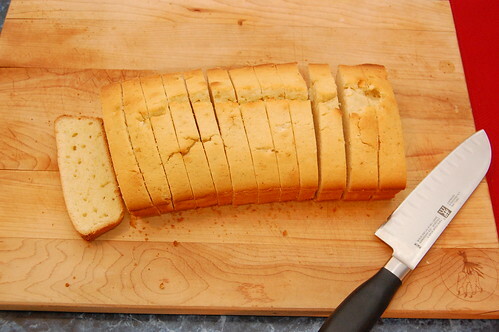 Use about two slices of pound cake in each layer. 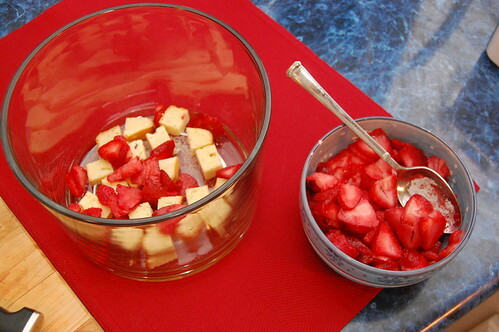 Add a layer of sliced strawberries over the pound cake. Because basically no fruit is in season right now, I used frozen strawberries and frozen blueberries.. which are frozen in their prime anyway. While cooling the pound cake the night before, I also sliced the strawberries and moved my fruit to the fridge overnight to thaw. After strawberries comes blueberries. 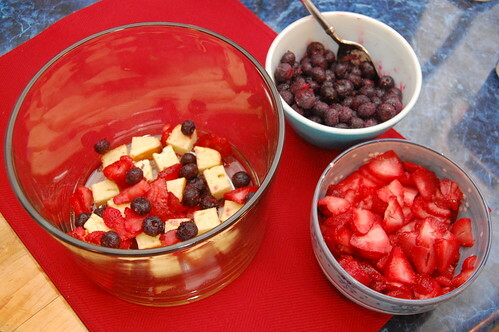 You should have sprinkled your fruit with a bit of sugar while it thawed overnight. 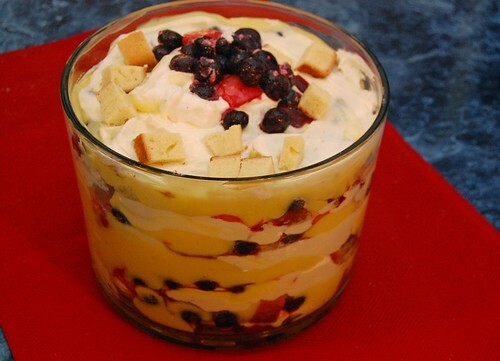 After adding the fruit to the trifle bowl, feel free to sprinkle additional sugar. 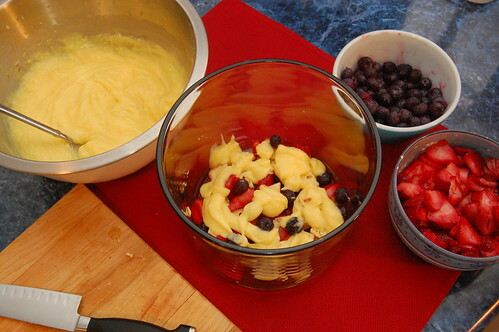 After fruit comes pudding. I used two small boxes of fat free/sugar free vanilla pudding. 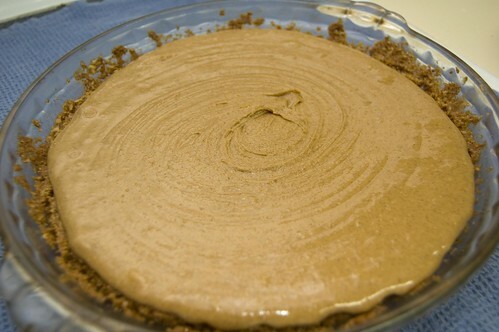 To make the pudding you mix each packet with two cups of cold milk, whisking for about 2 minutes. The pudding will set in about 5 minutes. 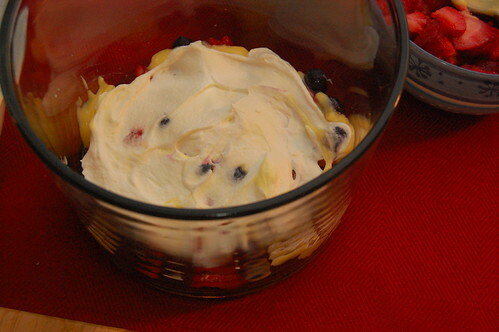 A layer of fat free Cool Whip will even out the cake and fruit. 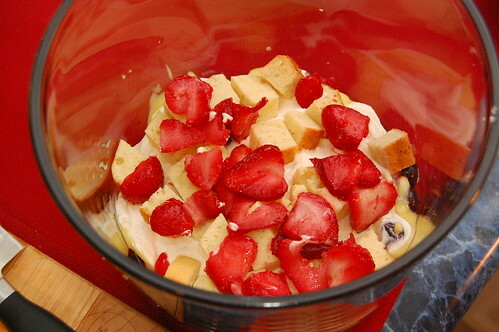 So pound cake, strawberries, blueberries, a sprinkle of sugar, pudding and Cool Whip is the routine. After the Cool Whip you begin your layer again. Lots of people like to get fancy here, arranging each strawberry slice individually. Ghost Baker refuses to indulge this level of detail! Rustic arrangements keep me sane. Do you notice anything that doesn’t belong in this photo? Prying noses and paws, perhaps? Once you’re done with your layers, you can get decorative at the top… making lovely fruit arrangements, adding dollops of Cool Whip, coconut, nuts or other kinds of fruit. If you’d like your cake to get a little softer and let the pudding and Cool Whip seep in, prepare this early and chill it until it’s time to serve. 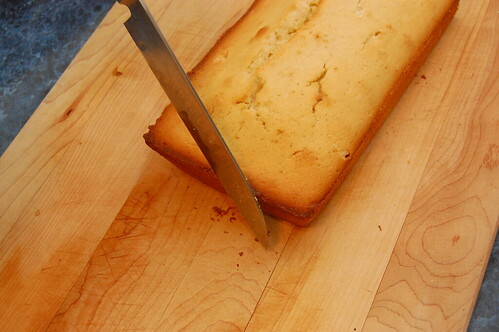 If you’re firmly against softened cake, then prepare just before serving. 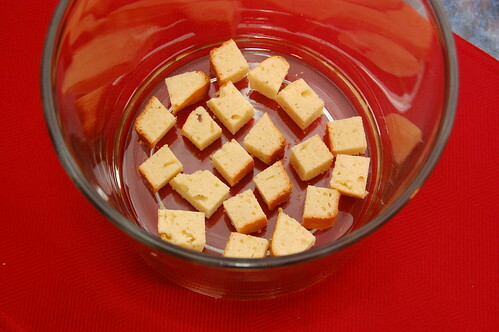 I enjoy the pudding-laden cubes of cake, so I prepare mine several hours before serving. Enjoy! 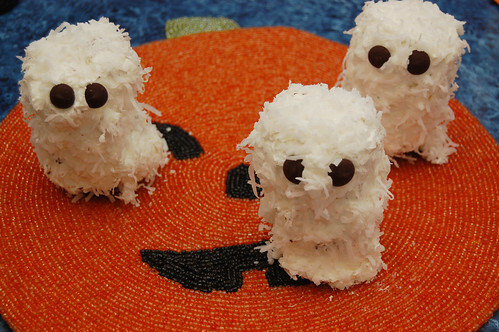 Day 3 of Halloween Week – Coconut Ghosts! Are you going to argue with a description like that? Heck no! 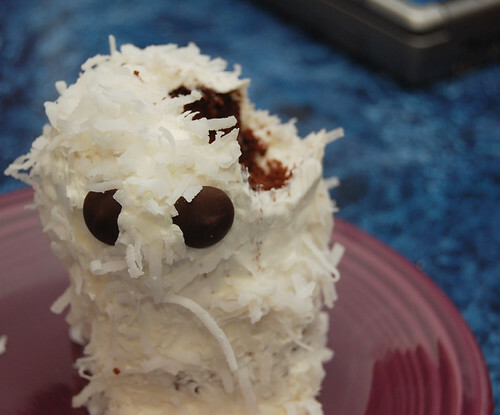 But if you’re needing something a little more kid friendly, how about ghost cupcakes? Break out your favorite Devil’s Food Cake recipe, or try Martha’s and cut it in half to make 12. 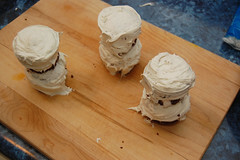 Remember that how many cupcakes you make will be cut in half, because you’ll be stacking two cupcakes to make a ghost. Yes, you can use a box recipe, too.. just don’t tell Edwin! Bake your cupcakes, cool completely, remove from wrappers and set in the freezer for a few minutes to firm them up. In the meantime, whip up a nice white frosting like Martha’s Fluffy Vanilla. When the cupcakes have firmed up a bit, frost the top and sides of each cupcake with a thin layer (using more on top) and then carefully stack two. Set back in the freezer for 10-15 minutes, making sure that they don’t topple over (you may use one toothpick in the center for added support, but if these cakes are meant for kids then you’ll want to be careful!). Don’t worry if your frosting is all crumby at this point – you’re just making a crumb coat. When frosting has set, remove from freezer and apply your final layer of frosting so that the cakes are completely covered. Cover the cakes with a layer of shredded coconut (which also helps hide any frosting imperfections that you were unable to get out). Add two bittersweet chocolate chips for eyes – if you’re having trouble getting them to stick just add a little frosting to the back. Use caution when transporting. Keep refrigerated until serving. 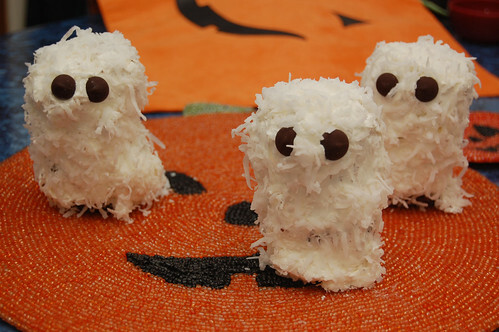 Note: My husband thought that these little cakes also somewhat resembled owls – I don’t see you couldn’t add a nice candy corn beak if you’d prefer to showcase owls instead of ghosts. But to make them more ghost like, make sure you put the eyes closer together. 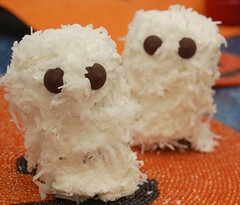 Comments Off on Day 3 of Halloween Week – Coconut Ghosts! Ahhhhhh, Halloween! Quite possibly my favorite holiday of the year. When else can you act (and dress) completely wacko without being considered a social pariah or candidate for a padded room? I still haven’t decided on a costume this year and time is running short. A friend and I are throwing a super hero and villians themed party and I haven’t been able to come up with an original, entertaining idea (suggestions welcome). Alas! With most hallween-style foods, it’s all in the decoration. You take a cookie and make it an eyeball, or a pumpkin, perhaps going extreme with a tombstone topped cupcake. 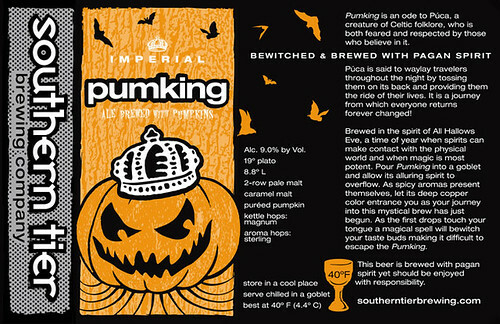 All cool (and tasty), but there are but there are some pretty cool inventive stuff out there as well. This was a cool idea someone shared with me some time ago; taking use of pretzels in a non-chocolate-covered way. Plus, the 3D aspect I’m a fan of. 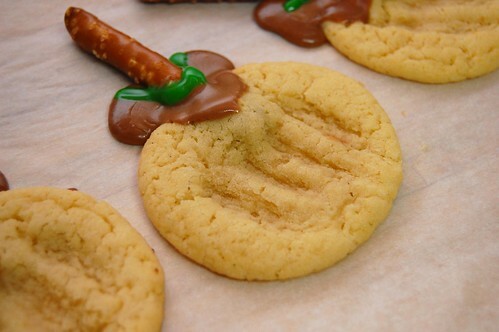 Cookie witch hats and brooms! A great activity to do with kids. Treat these as guidelines. Use whatever cookie you want; just be sure it’s one that doesn’t “spread” too much during baking. Shortbread is a great option. Prepare any cookie dough you’d like. For the hats, just bake some flat cookies. Once cooled cover with a chocolate icing or ganache. Top with a hershey kiss and pipe some frosting around the base. Voila! 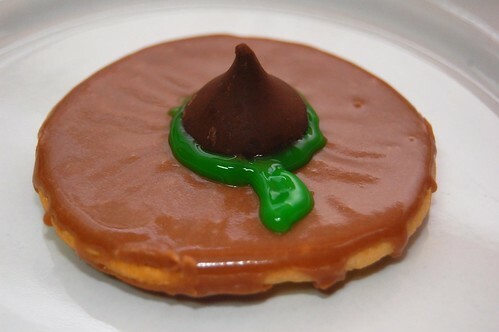 Super Shortcut: Take fudge-striped cookies from the grocery store (the ones with the chocolate covered bottoms) and simple top with a hershey kiss and piping. For the brooms, take some pretzel rods and break them in half. 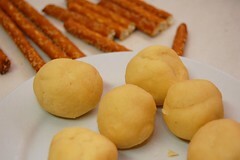 Roll some small, flat balls of dough and poke the pretzel in it. Set is on your pan and press the teeth from a work to make the broom bristles. The taller these balls are the more they will spread, so be warned. Bake per the recipe (if you don’t bake till hard, you can repress the indentions a bit when they comeout). Once cooled, drizzled chocolate frosting or ganache where the cookie and the pretzel meet. Enjoy!